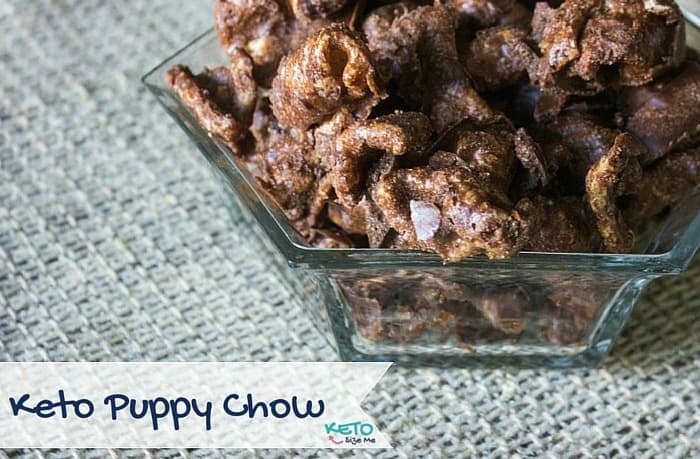 This Keto Pork Rind Puppy Chow is one of our favorite holiday snacks. If you like sweet and savory treats, this one’s for you! Since my husband joined me on keto, I have been trying to keep snacks in the house. My husband is a habitual snacker. He snacks after dinner while watching tv, and throughout the day. While I don’t personally recommend snacking like this, and I don’t do it myself, it doesn’t seem to do a thing to him. He’s lucky that he has an amazing metabolism (for now) and can eat as much as he wants whenever he wants, but being on the keto diet has been hard for him. If I don’t have some type of snack for him to eat each night, he gets pretty miserable and a little cranky. He has gotten better over the past few weeks, but I have found myself making at least 3-4 snack recipes each week. Tips: You can easily make this recipe by using the microwave, or you can melt the ingredients in a saucepan. Dump your pork rinds in a bowl before placing them in a freezer bag so you can get rid of the dusty crumbs. You may also want to break really large pieces up into smaller pieces. This will help with your serving size. Leave this in the fridge after eating so your chocolate doesn’t melt. You can also try dark chocolate. If you use sugar like erythritol, make sure you put it in a food processor first, so it’s more like powder. Pour pork rinds into freezer bag and pour chocolate over pork rinds. Hello! Last time a tried a recipe for keto puppy chow, they were really chewy. Is that normal? Hey Laura, It's been a while since I made this but if I remember correctly it was chewy until I put it in the fridge. After that it was a lot crunchier. You could always try that! Hope that helps! Puppy chow is one of my favorite things in the whole wide world and I was sure I would never get to have it again. Thank you so much, I can't wait to try this tonight!!!! Love your site and the way you keep Keto interesting and fresh! I was wondering the same. I'm a year late with wondering on this. Lol. Did u try it with 12 drops? Seems like alot because it's so concentrated. I can't wait to try this. Of course, I'm going to add nuts, 100% cacao chips and shredded coconut. Butter is listed but not in the explanation of the recipe. Am I supposed to add butter? I missed it so I hope they turn out. Thanks! Sorry Anne, it was in the photo but totally left out of the text. I fixed it! Thanks for bringing that to my attention. Thanks for this recipe- it looks amazing! I'm allergic to fruit- do you think I could sub butter for the cocnut oil, and honey for the stevia? You can but you will have carbs with honey. How do you keep it crunchy? This is delicious! But I am wondering how the nutritional facts work out. You put in 3.5 cups of pork rinds and get out 8 1.5 cup servings??? Maybe I read that wrong. Serving size is 1 1/2 or 1/2 cup? Made this today. It was really good. Placed the ziplock bag in the freezer immediately then I kept it in the freezer until I wanted a treat. YUMMY!!!! DUDE. this recipe is amazing. This stuff is addicting and satisfies my craving for chocolate and peanut butter! I did not use liquid stevia as i had none on hand so instead I used erythritol. A little over half a cup did the trick! Thanks so much for sharing this recipe! I wasn't skeptical but this was delicious!!! I used 2 tsp of pyure (granulated stevia and erythritol blend) and after I coated the rinds with the melted mixture I added some confectioners swerve and shook it up again. So, so good! Thanks for the recipe!